It was a rainy Tuesday afternoon and my feet had become tired as I had been wandering around London sightseeing all day. 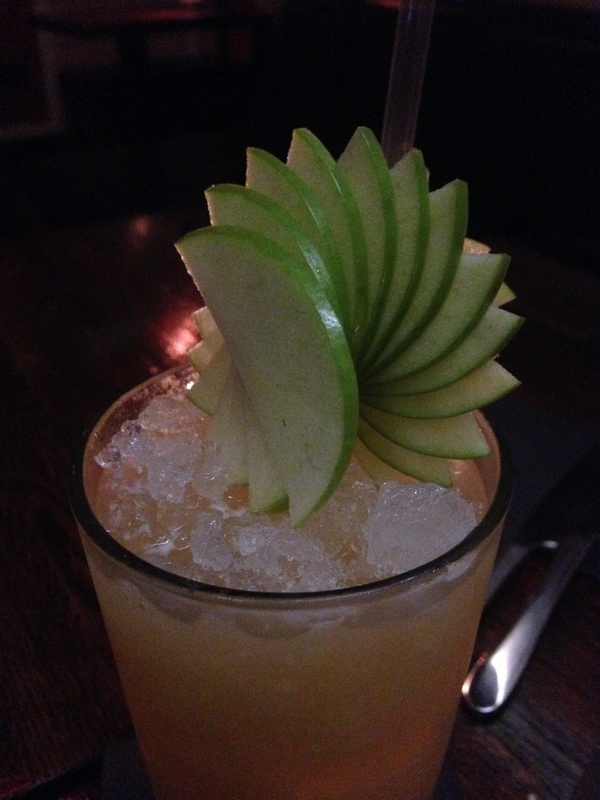 So my friend and I decided to seek solace in Apres bar, based a stones throw from Bond Street station. We wandered in and were shown to a cute, dimly lit corner table. The bar was quiet but it still had a fantastic atmosphere and I almost felt like I was sitting at a trendy underground bar in New York. We started with a couple of cocktails. The cocktail menu is extensive with many cocktails unique to Apres. Happy hour is every day (including weekends) from 5-8pm and you won’t be disappointed by the Happy Hour selection of cocktails. My initial observation of the restaurant/bar was that it had good chilled out music, dimly lit so it has a relaxed ambience where you could go on a first date, girly dinner/drinks or post work drinks. The décor was deeply warm yet vibrant. I started with the Candice Cocktail and my guest had the Tall, Dark and Stormy. The Candice was a fruity, martini type concoction which went down a treat after a long day. 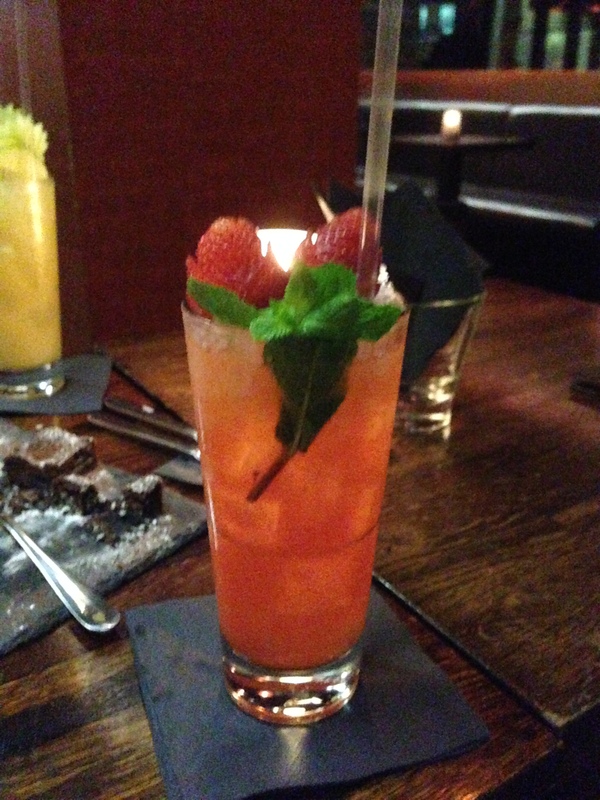 It is made from Gin, Aperol, Sugar and Watermelon among other ingredients. The Tall, dark and handsome is a long cocktail made with gin, blackberry puree, passion fruit, soda and other ingredients. Both cocktails looked classy, well presented, the alcohol wasn’t skimped on so went down a treat! During the course of the evening we ordered more cocktails and we were not disappointed by those. We had between us a Negroni, Passion Flower, Lav Me Tander, Katleya and a Pushkin. I could go on and on about these cocktails but I think it would suffice to say each and every cocktail was unique, fruity, alcohol fused and delicious in every single way. You can view the cocktail menu here to read about all the other elements of the cocktails we had. We then went on to order some food. We started with the Sweet Potato Straws which were thin, nibbly, noodle-like pieces of sweet potato which were lightly spiced and fried. These were absolutely delicious and very more-ish. For those of you who are familiar with Gujarati cooking these were almost Sev like. This dish was a good accompaniment to the other dishes we were about to order. 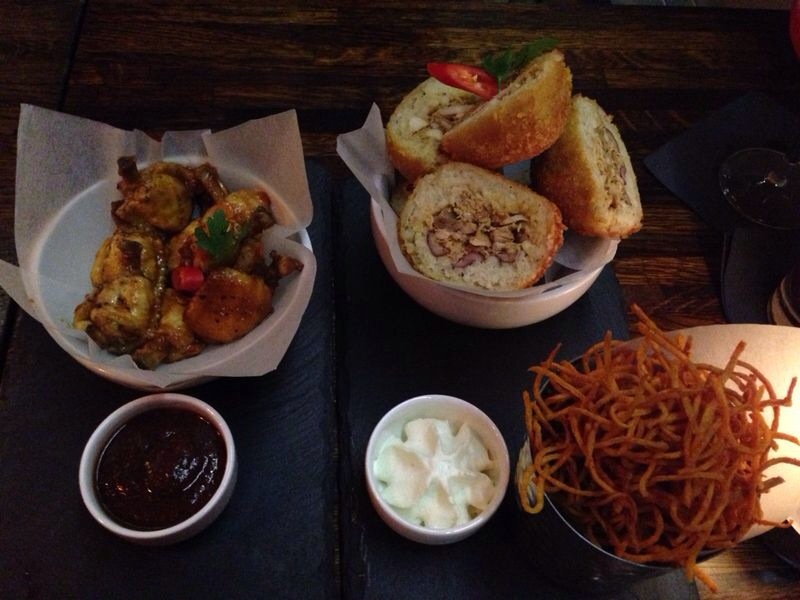 We then went on to order the Jerk Chicken Arancini and the Chilli Smoked Hot Wings. I think my friends comment on the Arancini says it all ‘the best Arancini I’ve ever had, even better than an Italian restaurant’ the Arancini balls were a generous size, delicately spiced with traditional jerk seasoning, a good crunch, crumbly texture and a good fusion of Caribbean and Italian cultures. The wings were bite sized hot wings with a smoked spice flavouring, tender and the good quality chicken just fell to pieces in your mouth. We ended with the Oreo Brownies which again were a unique take on a brownie. 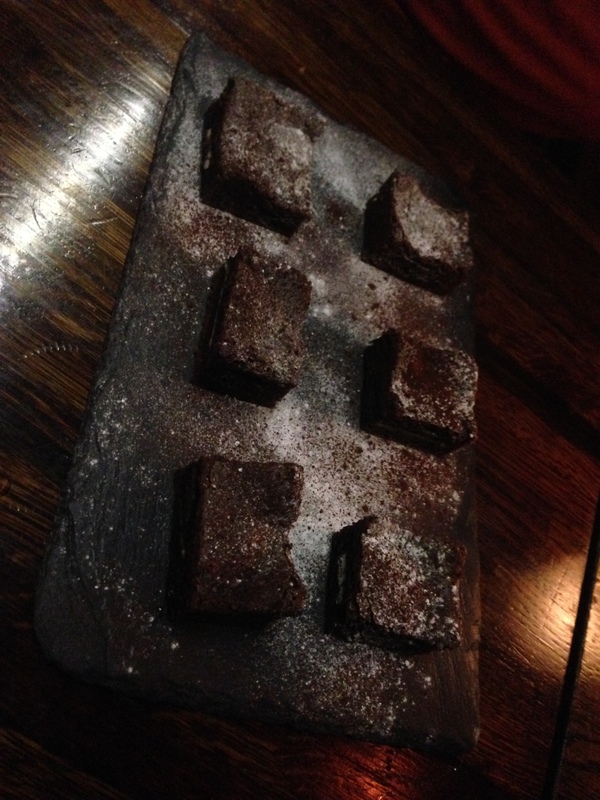 They were more biscuit based rather than the traditional brownie but was still rich and chocolatey. Personally I would have liked the brownie to be served with perhaps a little cream or ice cream but was still the perfect end to a perfect evening. Overall everything was delicious, well presented and in a nice central location. 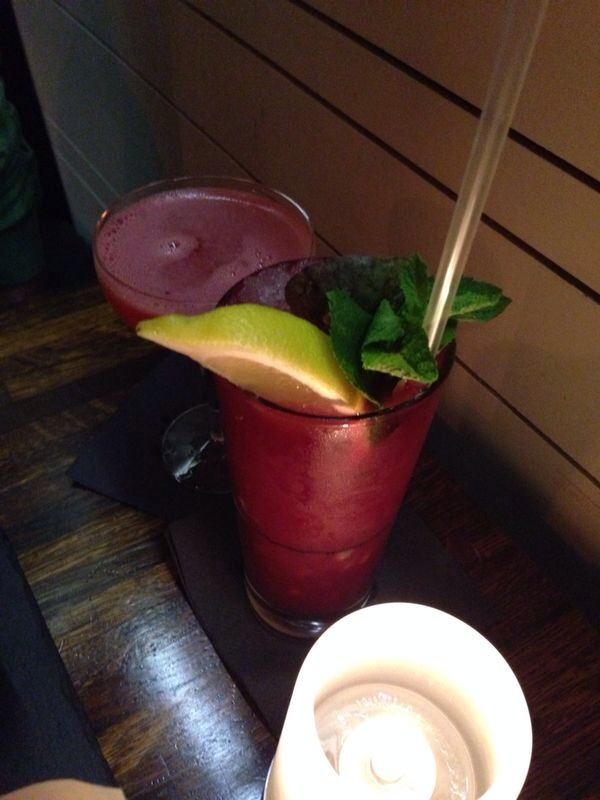 For fabulous cocktails and good quality, fresh food Apres is the place to be! If you can’t say anything nice..